Charts are graphic representations of knitting instructions. They are a compact way to illustrate more patterns that would take much more space if described in text instructions. Charts also illustrate how a lace, colourwork or cable pattern will look once it is knit up, and this means that when you use charts, it is easier to see where you are in a pattern, and identify errors early. After a bit of practice, most knitters find working from charts much more intuitive, quick, and simple than working from line-by-line text instructions. Chart motif from the Botany Shawl … this is an extreme case where writing out line-by-line instructions for this large-scale motif would be entirely impractical. In a chart, each square represents a knitting stitch, similar to the way that each abbreviation in text instructions does (for example k2tog or p1). The first thing you should check when you start knitting from a chart is the key or legend, and chart notes if they are included. This will explain which symbols represent which kind of stitches. Often, an empty square means to knit the stitch, and generally, a yarn-over will be represented by an O in the square. However, each designer may have a different format and set of symbols. Once you understand the meaning of each of the symbols, you can proceed to knitting the chart. The key (and chart) for our free beginner lace pattern, the Gothic Lace Cowl or Scarf… check it out! Are all rows shown… or just the RS rows? Charts will either show all rows (or rounds) or only illustrate one side of the work, usually the right side. If the chart shows only right side rows, text instructions will be given for how to work the wrong side rows. The omission of wrong-side rows is common in lace charts, because many lace patterns are simply purled on wrong-side rows. As you can see from this illustration, the structure of the lace pattern shows up much more clearly when the wrong-side rows (which aren’t conveying much information) are removed. The Gothic Lace pattern shown two ways – with all rows shown, and with WS rows omitted. As you can see, the chart is more compact and relates more clearly to the structure of the knitted fabric when WS rows are omitted. Check out the free pattern here! But how do I actually knit following a chart? Once you’ve reviewed the key and chart notes, and determined whether all rows are shown, or just the right-side rows, you can get started knitting from the chart. Typically, for right side rows, you will work the stitches one at a time from RIGHT to LEFT. So where only right side rows are shown, this means that you read each row shown in the chart from RIGHT to LEFT. To work the wrong side rows, follow the instructions given in the text or chart notes. If the chart shows BOTH right side and wrong side rows, you will work the RS rows from RIGHT to LEFT, and the WS rows from LEFT to RIGHT. If you think of the chart as a picture of the finished fabric taken from the right side of the work, this makes sense, as the RS rows are worked one stitch at a time from right to left, and the WS rows are worked from right to left too… but on the opposite side. A careful reading of the chart key is crucial in this case, because often chart symbols are worked in one way on the right side of the work, and in another way on the wrong side of the work (for example, knit on the right side, purl on the wrong side). What are the heavy lines? Commonly, stitch and row repeats are indicated by heavy lines (or boxes) in the chart. This is similar to the use of brackets in text knitting instructions. So you would work the edge stitches one time, then work the ‘repeat’ stitches as many times as possible (always reading the set of instructions from right to left on right side rows), before ending with the edge stitches at the end of row. Our free beginner lace pattern Gothic Lace has a pattern repeat that is 8 stitches wide, and 12 rows tall. What do I do when I get to the end of the chart? After you’ve worked the last (top) row of a chart, you would typically begin again at the bottom at row or round 1, if the stitch pattern is repeated several times. The text pattern instructions will let you know how many rows / inches to work following the chart. Lace patterns are often described only in charts, as they may have large stitch and row repeats can make writing out (and reading) lace patterns quite cumbersome. At Tin Can Knits, 90% of our lace patterns use charts that only illustrate the RS of the work, because we find these types of patterns much more intuitive, simple and satisfying to knit. The lace chart for the Sunflower Shawl shows RS rows only. You can see clearly how the chart motif corresponds to the knitted fabric. You read the RS rows from right to left, and follow text instructions for the WS rows. Of course, there are always exceptions to this rule, and when both sides of the work are charted, you will work the RS rows from right to left, and the WS rows from left to right, making sure to check the key so you understand how stitches are worked on the RS vs the WS of the work. The lace chart for the Kits Kerchief includes both right side and wrong side rows, because they are required to work the lace motif. You read RS rows from right to left, and WS rows from left to right. Fair-isle stranded colourwork is usually worked in the round, so that the RS of the work is always facing, you are working the knit stitch most of the time, and you can easily see the pattern forming as you work it. However, there are some exceptions to the rule in which colourwork is worked flat (in rows). Either way, charts for colourwork patterns will generally illustrate every round (or row). If the pattern is to be worked in the round, then you will read every round from right to left. Our free ornament pattern – Fancy Balls – includes three simple colourwork motifs, knit in the round. As you can see, all rounds are shown on the chart. If the pattern is to be worked flat, then you will read the right-side rows from right to left, and the wrong-side rows from left to right (in the opposite direction); in order for the pattern to form as designed. The Goldfish cardigan is knit in rows. You read the RS chart rows from right to left, and the WS chart rows from left to right. Because the fabric is stockinette stitch, you will knit all stitches on RS rows, and purl all stitches on WS rows, using the colour indicated. As fair-isle colourwork is typically stockinette stitch (knitting all sts on the RS, purling all sts on the WS), the chart key will typically describe which colours to work each stitch with, rather than the kind of stitch to work. So when you see a square that corresponds to CC1, you will knit one stitch with contrast colour #1. The chart for the North Shore pullover includes several contrast colours, as shown in the key. You will knit all stitches in the colour indicated, unless the stitch is a decrease… as shown by the symbols for k2tog and ssk in rounds 19 and 21. Cable charts may either show every row or round, or show only right side rows, with instructions for ‘keeping in pattern’ given for the WS rows (typically you would knit the knits, and purl the purls). One special feature of cable charts are the symbols for cable turns. Cables are worked over more than one stitch, so the symbols for cable turns are more than one stitch wide. As you can see from the antler cable below, c4b and c4f – cable 4 back and front – are worked over 4 stitches. Be sure to review the chart key before you cast on! This cute free hat pattern – Antler Hat – is knit in the round, following a chart which illustrates all rounds. Each round is read from right to left. Know somebody who’s struggling with charts? We’ve created this tutorial for you and your friends! Help us continue to provide these great resources by sharing with your friends, and joining the chat on Facebook, Instagram, Twitter, Pinterest and Ravelry! Do you have a specific question or concern about reading charts? Let us know in the comments, and we will do our best to point you in the right direction. Thanks for the tutorial, I think I get it but I’m still stuck with a bonnet pattern I am attempting. The written pattern instruction directly before the commencement of the chart says I should have 41 stitches – which I have. However if I count the number of stitches (including the required repeat) in row one of the chart, it is 47 stitches, and when attempting the chart I run out of stitches before finishing the row? Hi Naomi – I can’t really say without actually looking at the pattern. It could be that the chart is increasing sts, or it could be that you are counting the yarn over’s as sts needed to work the row…. I’m knitting a sweater which has a color chart of 21 stitches, 8 rows. It’s all in 1×1 rib. I know that this must be a repeating pattern. But I’m not sure how to do that. I know I read the chart from right to left (it’s in rows). Once I do one section of the 21 stitches, do I then keep repeating that until I get to the end of that first pattern row? And then I turn and start knitting the second row left to right? I have a feeling it’s simple but I’m just not getting it. It sounds like you have a 21 stitch repeat (unless there are any dark lines around any sections, that could indicated the repeat is less than 21 sts), you would work row 1, 21 sts, then repeat those 21 sts all the way across the row. Then on row 2 (if the pattern is in rows rather than rounds), you would work the chart from left to right. Hi Bertha – you can convert a cross stitch chart to a knit pattern, each cross would be a knit stitch. You might want to swatch it though, to make sure it’s coming out the way you want. What does the capital R and the dotted lines outside of the patter mean? Hi there, I’ve been searching for the answer to a lace pattern question. It is hard to explain, but here goes. The pattern on the right side calls for yarn overs, some before a knit stitch and some before a purl stitch. Or before knit 2 together or purl 2 together. The wrong side rows are not shown and I would normally knit or purl them as they appear. But I have seen that some people purl into the back loop of the yarn overs, specifically the yarn overs before purls of the previous row. The chart is in Russian and it taken me days just to figure out the chart symbols. Hi Cindy – I think you probably want to purl the WS rows. Working through the back loop would make the hole created by the yo a little smaller, so it should be okay either way. I am starting the lace yoke pattern for the pippa dress. It states to repeat yoke chart 2, 8 times for the 6 month size. Is it really all 32 rows 8 times? It seems like the yoke would be very big. I do not understand how many yoke repeats there are. I think I fugured it out. Work all the way across the 3 charts but work chart 2 8 times across. There are only 32 rows total, is that correct? I’m working on your Stovetop Hat. This is my first time reading a chart and doing cables. I think I’m okay except for one detail. The chart shows only odd numbered rounds. The instructions for even rounds say” work as established- knit the knits purl the purls” does that mean to do the cableing sections also in the even rows? In other words do I completely repeat the previous odd row again in the next even row? Round 1&2 are exactly the same? round 3&4 the same? Etc… OR does it mean to “knit the knits purl the purls” without doing the in front and behind cables? Please help. I love your designs and your website!! Hi Nancy – nope, no cabling in the even rounds, just knits and purls. Does that answer your question? Ah ha! thank you! No cabling in the even rounds!!! I’m knitting a lacy cowl in the round and the pattern is on a chart. Please explain .. on one row there is a yo followed on the next row by a black solid box. The key explains it as,“this st is used with the dec of the first rep, work it as charted in future reps” the next stitch is k tbl. in the next row above the black box is a yo. Hi Linda – that’s a great question, I’m sorry, I really don’t know what that means at all. Have you tried contacting the designer? I’ve bought your marshland sweater pattern and am having a bit of a time figuring out how to go about the yoke. Ive cast on the stitches for my size (92), placed my marker and knitted one round. I don’t understand the increase instructions however. When do I increase? are these instructions for one round? Im a little lost. Thank you for any guidance. Hi Kathryn – for your size you would [k3, m1, k3, m1, k3, m1, k3, m1, k3, m1, k4, m1, k4, m1] around. That’s for 1 round. I have been reading all your info on reading a chart in knitting. I am doing a sweater and cannot understand this chart. I am working in the round and am ready to start the color work. It has a red line around the very first box which it days the symbol means repeat. Repeat what..than no box and then another repeat box. I would be glad to send you a copy of chart if you could help me understand this. How do you keep track of aran cabling when some charts don’t equal numbers of stiches. Im reading a cable chart that has different charts across the front some are eight repeats some are for repeat patterns and some are six row repeats so how do you manage a 6 repeat with an 8 repeat and a for repeat so you don’t make a mistake? Hi Becky – I usually use a locking stitch marker, but if possible, place it in the stockinette somewhere rather than in the cable itself, just makes things a little easier. Hi Alexa and Emily – I’ve never done any colour work and would like to have a go at it. Which of your patterns would be the best one for a beginner. I’d like to try a sweater but thought it might be too ambitious? Any suggestions would be welcome. Thanks! Hi Liz – if you have done a sweater before I’d say start with maybe Compass, it just has 2 colours and the sweater is pretty simple. If you want to try it all out in a hat I’d say go with our free Clayoquot toque pattern, or the new Fleet hat, or maybe the Banff hat? They are all great first Fair Isle. I am about to start the Tall Dark and Handsome hat — but I don’t understand how the chart applies when knitting in the round? Help! Hi Kristin – when working from a chart in the round you want to always start at the right side. You work each row of the chart all the way around. Does that help? I am working on knitbot’s Sycamore Vest. Row 1 requires following Chart A to the mid-back, then following Chart B, which mirrors Chart A. All rows are written out. When I do row 2, should I begin with Chart B or Chart A? I’m confused! I am making the spotlight sweater I am on row 11 of the chart and am totally confused with the no stitch. I have no clue what to do? Hi Gloria – just do nothing. Move to the next stitch in the chart. Hi Mary – I’m sorry, without a key I can’t really say. They are probably leaning decreases, usually a circle is a yarn over. Hi, I am really struggling with the chart for the Low Tide Cardigan. Under the chart, it says to refer to the pattern instructions for edge stitches worked either side of the chart but I can’t find anything in the pattern. The pattern says (Right Front Bodice) K4, work chart A to marker, K4. So do I work the 7 stitch repeat in the chart until there are 7 stitched left, then do the edge stitches from the chart, yo, k2tog, then knit 4? Hi Carol – You have it right there, the k4 before the chart and after the chart are the edge sts. You are working the chart on the sts in between. You have it right but it is to the last 6 sts, yo, k2tog, k4. I am knitting a 30 stitch cable- because I am knitting a larger size than the standard it says for RS work 30-st rep 4 times and work first 21 sts once- I assume this means 4 of the 30 stitch cable and then the first 21 sets of the cable. My question is on the WS do I start with the first 21 sts of the ws cable and then do 4 repeats of the 30 st pattern or do I do 4 repeats and then the 21 sts? Hi! I have a question about shifting BOR in the Chrysanthemum pattern. I am knitting a blanket and I’m on row 85. So I have moved the BOR 3 times already, one stitch to the left. But now I’m not sure that’s correct because it says – to shift BOR left: prior to working the round the remove marker, knit 1 or 2 stitches as indicated, replace marker. I don’t see where 1 or 2 stitches are indicated. On rows 29, 43, 67 it seems the bold chart line moves over 1 stitch. But row 85, the bold chart lines moves one st to the left, but the arrow is pointing left. Such a dumb question but I’d sure appreciate your answer. Hi, I love your stuff! Today I have charts with no row designations. They are part of a free pattern for knit flat baby afghan on Ravelry. Although they tell the number of stitches each chart is worked over, there is no designation for the rows. I can’t tell if each row in the chart represents one row of work or two rows. Thank you, and keep up the fine designs! Hi. I want to enlarge a chart that is in a PDF document. How do I do it with free software please? Hi Elaine – If you want to enlarge it simply to view on screen, you should be able to zoom in. Then you could take a screen-shot of that area of your screen at the zoomed-in view. If you want to print it, you can change the print zoom percentage (set it to 200% or something) in the print dialog box when you print. Or you could print the zoomed-in screenshot. Elaine, this has worked very well for counted-cross-stitch patterns, and I plan to do the same with lace charts … I make an enlarged copy (and a spare, of course!) at Office Depot. As a senior, I’ve found these to be so easy on the eyes, and the cost is probably was under $1.00 per copy, if memory serves. I’m doing this pattern: https://www.bhg.com/crafts/knitting/kidswear/knitted-guernsey-pullover-and-cap/ and I’m confused about the chart to begin with. It says to use the 8 stitch repeat, the chart has color-coded dark lines, but they don’t match, i.e. Red on the left side says “8 st Repeat” but that matches the dark black line on the right, not the red line. Shouldn’t the repeat be outlined by the matching colors? What are the green lines for? Hi – we can’t provide pattern support on other people’s patterns, sorry! You’d do best to contact the designer, or whoever published that design. Good luck! First off, thank you for such a detailed and wonderful illustration of how to read charts. This was very very helpful. And I’m sure many many people are enjoying your instruction. Here is my dilemma. I am knitting a dinosaur blanket for my new grandson. I didn’t much care for the free dinosaur patterns that I found, they were either too detailed or too simple. However, I did find some darling dinosaur patterns under perler bead patternss that were just right. I know that perler beads are done on an exact square pattern. And I also know that knitting patterns do not knit up exactly square. So how do I modify a square pattern to properly knit up as a knit pattern? Have a great day and hope to hear from you soon. Thank you. Hi Sherry – I’m not 100% sure this is what you are asking, but I think what you want to know is the approximate ratio of width to height in a stockinette stitch? It is about 3 sts and 5 rows to get a square in a DK or worsted weight yarn (but I would measure the ratio in my gauge swatch, or check the ball band for their suggestion). Does that help? Thank you Alex. Using this ratio to knit a pattern that is a charted in a perfect square then, in order for the pattern to come out visually correct, I would need to repeat each pattern row 3 times in order for the visual pattern to match the square chart I worked from? I am using DK weight where 20 stitches = 1 inch. My square will be 2″ by 2″. If your familiar with Perler beads, Pintrest has hundreds of patterns online. I saved several of the dinosaur patterns and wondered whether they would come out exactly as pictured since (I am given to understand), knitting stitches do not quite match square charted patterns. Perhaps I’ve been misinformed formed? I am about to knit a Crazyheart and have a question about the chart. I read it from right to left. But as the wedge decreases in width, there are step ins. What do I do about the first stitch after my BOR marker in these instances? Do I slip it and then knit it as part of the decrease on my final repeat? If it helps you understand what I’m on about, if I look at the chart for the Crazyheart, what do I knit on top of stitch 1 of row 16 when it comes to knitting row 17? I tried to figure this out by looking at the chart for the Tenderheart and what happens between row 14 and 15 but I still can’t work it out. Beginner knitter here obviously! I’d be really grateful for some help. Love your patterns. I’ve done a flax and a peanut so far. Working my way through them! Thank you. Hi Kate – The ‘step ins’ represent the number of sts that actually exist at that point, so you can just keep following the chart exactly as before, stitch by stitch. Hi Susie – in the written pattern and the chart notes it states to knit the knits and purl the purls on the WS rows. Hi, I’m making the chasing cable throw. The directions show a stitch guide then directions for the cable square. I don’t understand how they are suppose to go together. Can you help? I am working on a shawl using a Katia pattern. I understand the chart for the first 34 Rows . then the instructions say to continue, in the pattern, increasing 1 stitch 2 stitches from the edge. I get that. The problem is the chart does not have any black lines to indicate the repeat pattern. It shows 4 rows that are the repeat rows but does not take into account that the number of stitches per row change as you increase. I tried a couple of rows but it doesn’t work out correctly. I brought it my local knit shop where I purchased the yarn but they were not helpful st all. Hi Cheryl – I’m sorry, I’m not sure what they are looking for. They may intend that you understand the stitch pattern and can increase within it? I might try emailing the designer or published for a little clarification. Next row: work edging chart over 4 sts. What does over 4 stitches mean? This pattern is called the Lestrange cloak from the unofficial harry potter knits from 2013. If anyone is familiar with it I would really appreciate your help! I have been struggling with a lace chart for a sock. My struggle was with the ssk stitches that seemed to make it not correlate mathmatatically. It just dawned on me that it is being left blank as a knit stitch would be. The red lines are telling you to repeat that section or block of stitches for your pattern. I have tried but 1 miss 1 stitch. One partner is 8 stitches. Hi I am working a fair isle flat pattern in a stockingnet. The directions for starting the first colorwork chart say …start chart on the wrong side. Does that mean I should start row 1 from left to right ? Hi Marian – yep, that sounds right! Hello i am having trouble reading my chart. I am working with a circular needle in the round and the pattern starts off with non knitting space how do you work that? It is the father cable pattern. Hi Kimberly – I don’t really know without seeing the actual pattern, but I would assume if the pattern has a ‘no stitch’ you should just ignore it and move to the next square. Hello. Thanks for setting up this page – it’s really helpful! Recently I saw a chart that had a stitch notation that looked like a wide v with a 2 in the middle of it. Then the next stitch was a U. Can you shed any light on what these symbols might mean? Hi, I’ve got a chart that is worked flat. Each row has a filled in color for the pattern (dishcloth will look embossed when finished as so many do). Do I knit over to the colored squares on the grid then purl the squares that make up the design on the right side of my work, then on the wrong side of my work do I purl over to the design then knit those stitches? I’m used to purling across the wrong side. If I do this then the dishcloth will be huge. There are 42 stitches across and 60 rows. Thanks! HI Denise – sorry, without looking at the pattern I really don’t know! Hi Jane – no stitch means just that, ignore that square. They are usually inserted to clarify the motif, or because there are decreases etc. In your example of the Gothic lace, why don’t the edge stitches look like they are decreasing if you are knitting two together (k2tog) on each row? Won’t that decrease the number of stitches on your needle and change the available number of stitches to work with on the next row? This has always confused me on chart patterns and I never know how to continue. Thank you for your very clear and detailed explanations on everything else! Hi Laura – while the k2tog on each row is a decrease, the yarnover is an increase, so there is no net change in the number of sts. Does that help? The written directions for Row 3 of the Gothic lace is incorrect – the repeat is missing a K1. Right you are! All fixed now, thanks! Hi Samantha – kind of depends what the p2sso is? Is it pass slipped sts over? Then work rows 1-26 of cable chart 20 times. a dot in the box is a purled stitch; and A V in the box means to sl 1 wyb on the rs; and sl wyf on the wrong side. So, if Im reading the chart correctly, I would start at row 1 with knit 3 and proceed to the end and for row 2, I would start 25 puled stitches. When I see the VVV, do I slip 3 stitches? I need to chart a 3 stitch increase over 1 stitch to create a spot for a 4 stitch spiral cable in a Celtic cable pattern. I was thinking doing a M1, k2 in next stitch, and then another M1. How would I chart it, making sure I account for the no stitch spaces? I would probably create a symbol and then explain it in the chart key. Please, tell me what means number in the chart row (not the num of row) , like in the Song of Zion by Mario on ravelry. Thank you! Hi – sorry, i don’t really know. One thing that is sometimes done if there are many stockinette sts in a row designers will put the number of sts in the middle. Eg, if there are 17 knit sts the number 17 will be in there. I am crocheting a drop pattern 164-16. I understand I read diagram from right to left. But what if the next row only has one symbol (7 Doubke crochets) In chain? Above that, the next row has 7 chains only. Also, why is it showing me A.8 above A.2 which is section I’m working on? Please help. Hi Lori – sorry to be unhelpful but I don’t know TOO much about crochet patterns. Usually when asked to chain 7 you skip 7 stitches in the row below and place the next stitch in stitch 8 . Unless you are making lacey loops. When coming back on the other side you will not go into each of the stitches of the chain but rather grab the yarn under the entire chain x7 or however many is indicated. Essentially making a 7 stitch “hole” in your piece. Hi, I am knitting a baby cardigan (March from Isager) and there is a 7-stitch pattern for the front edges, 5 + 2 lace st. My question concerns those 2 st. I am wondering if I should also k2tog, yo, at the end of row 1, or do the reverse in order to have a symmetrical lace pattern. Looking forward to your reply, thank you in advance! Hi – I’m afraid the answer is a pretty unhelpful, I don’t know. It depends if there is a button band picked up or something there, or if there are edge sts indicated in the pattern. Without seeing it I’m kind of unhelpful, sorry! These 2 lace stitches are a combo with a 5-st. garter stitch border with buttonholes. My pattern says to, “place center st of graph at center of bonnet”. It’s a Norwegian pattern and this centering this is different than Fair Isle (or so I have read). It’s a lace pattern, not a color design. I am experienced, but I just don’t get how to do this. I see the concept, but I don’t LITERALLY know how to make it happen. Do I just add extra “filler” sts at the beginning so that the center st of the chart matches the center st of the work? Hi – I’m sorry, I don’t either! It seems like you would need a certain number of sts before and after the chart to make it fit? Or does the chart fit with the number of sts you have? The chart I am about to start (first timer) has a shaded box which states ‘No stitch’. At points on the chart it has 3 in a row? Not sure what this means. Confused. Hi Denise – shaded ‘no stitch’ boxes are sometimes inserted to make the patterning more visually clear. You can just totally ignore them. Thank you so much for this tutorial! I love your patterns but was a bit daunted by the charts as I have never used one before. I feel confident enough to try one now…just need to decide which one! my pattern reads multiples of 16+47. I ended up with 5 stitches at the end of the 1st pattern row that didn’t fit into the motif repeat, nor were they part the 3 stitch garter edge. how on earth do I knit those 5 weird stitches??! I’ve contacted the designer, but she hasn’t responded. Hi Judy – If the pattern calls for multiples of 16 + 47 it seems like there will be 47 edge sts, so you would want to stop working the 16 st repeat 47 sts before the end of the row, then work the edge sts. I’m working on Arcadia poncho; have done the 14″ down-but I’m stuck (mentally) regarding “establishing the chart”. I’m concerned about the seam from the garter stitch 14″ down. Does the chart make provision for that or is this visible seam going to be in the front of my work. I want it in the back. Hi Johanna – I’m sorry, the Arcadia poncho isn’t one of ours so I’m not really sure? I’m making this poncho right now. The 30-stitch chart pattern is done on both the front and the back of the poncho. When wearing the poncho, you can make sure the “seam” is in the back. I am knitting the antler mittens pattern. I am a little confused for the gusset as ’round 1′ and ’round 2′ give an instruction and says to ‘work chart’; then I have to work ’round 1 and 2′ while ‘working the chart’, 4 times…..so am I repeating to work ‘row’ 1 and 2 of the chart or continue working the other rows (3-6) until I have worked a total of 8 rows? Hi Christine – you are always working the next round of the chart, regardless of what else is happening in the mitten. I am knitting the 1999 sweater and having trouble with the lace chart. On row 3 of the pattern, I have completed the 4 stitch repeat four times and am now left with three stitches left – too many for the yarn over, make one, knit one that are left to finish the row. I can’t figure out how to make the number of stitches work. Can you help? Hi Jen – There are edge sts before the repeat starts, did you work those? Hi Char – I’m not sure, it seems like the second half of that instruction is missing? You will continue to decrease every row until you have decreased 13 sts on each side and then it looks like there is a second instruction after 7 more decrease rows? I want to knit the “May Shawl” found on Ravelry. It has been interpreted from Russian and I think some of the instructions are a little iffy. After studying it I am wondering if the pattern should be reversed after the center stitch or should it be knit the same as the first half. Thanks for any help you cangive me. 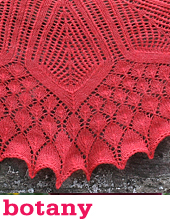 Hi Tess – it looks like the lace pattern is symmetrical so you can work it the same way on both halves of the shawl. Hi, I’m doing my first chart based afghan (Textured Knots by Nora Gaughan) and the chart has every line numbered (odds on the right, even’s on the left) which I understand to mean that I work from right to left starting on line 1 (RS), then on line 2, I would work left to right (which should be the WS?). In the key for the chart, it says that the open squares indicating K are to be P on the WS (and vice versa for the P). My confusion is: if line 2 is supposed to be the WS, then why not write it that way, OR am I supposed to follow line 1, return to the start “reversed” then work line 2 as the RS and not the WS (even though line 2 is written on the left)? Perhaps they just numbered on the left for convenience but it’s against all convention that I’ve read for charts. I’m really confused so any help would be appreciated. Hi Jen – I think that’s a pretty common way of writing charts that are worked back and forth (that’s how we do it). This way, the chart is a much better visual representation of the actual fabric if you show the chart as if you were looking at the RS of a piece of work. Line 2 is defintely suppsed to be the WS, so the symbol you mentioned means you purl on the WS. Hi everyone was wondering if anyone knows pink box on a chart means? Unfortunately it will depend on the chart, is that info missing from the key? For the first time, I have come across a chart where all of the row numbers–both even and odd–are listed on both sides of the chart. Therefore I do not know if I am working all the rows right to left or some left to right. There is no explanation on the chart. The pattern originates in Germany and I don’t know if the European charts may be different?? It could be that the chart is worked in rounds at some point in the pattern and rows at other points. But it should tell you where to start the chart etc. I’m knitting a shawl and have (correctly) 179 stitches on my needles as I start a chart pattern that shows only 41 stitches with two 10 stitch repeats – so how do I manage working 179 stitches with a 61 stitch chart? Hi Margaret – so there are 2 10 stitch repeats, how many sts are outside the repeats? I am knitting the “Wish Upon A star Baby Beanie” from All Free Knitting and I am totally confused by the chart. I understand the color change but what happened to the stitches where the chart disappears? Hi – so, for the 5-7 year size you are working b, b, a, a, b, b, a, a which are 6, 6, 30, 30, 6, 6, 30, 30 sts for a total of 144 sts. When working charts you are working the rounds in order. So you will work chart b, row 1, chart b row 1, chart a row 1, chart a row 1, etc. I’m working a chart pattern but the pattern says to increase 2 stitches at the beginning of each row. I’m unsure how to go about increasing and working in the chart pattern at the same time. Could you help? Wow! What an incredible comment section! Alot of times a chart asks to work between letters (B and C example), but there is sometimes a pattern instruction that crosses from C to D and I don’t know how to interpret it. Hi Penny – I’m sorry, I’m not familiar with the kind of chart you are referring to…. Can these chart symbols be used internationally? Hi! I’m reading a chart and um, the ‘repeating pattern’ is 25 stitches….however, there are 120 stitches around… what do i do?? Are there any stitches outside the 25 stitch repeat? Any edge stitches? Hi, I need some help with a knitting chart regarding the knit and purl stitches. I enclose a link to the chart and would be grateful if you could clarify for me what they mean. I am talking about the purl on RS and knit on RS boxes. (The chart is right at the bottom of the link). Thank you. Hi Tracey – I think there must be a typo? I don’t understand the first chart symbol instruction either. No typo, I think. It just says that a blank square is purl on RS, and so is a horizontal line. Purl is the most common stitch in this pattern, so a blank square is used to avoid visual clutter. It would be pretty out of the ordinary to have 2 different symbols mean the same thing. But maybe? It’s not quite 2 different symbols meaning the same thing. Japanese charts typically use a blank cell for whatever the most common stitch is on that particular chart (usually knit or purl), presumably in order to avoid visual clutter. The notation with the equals sign tells you which symbol is being “blanked out”. Hi – hmmm, that’s interesting, I’m still not sure I understand why a blank square doesn’t just mean purl on RS, why the extra instruction for the other symbol? Hi, I need help with the knitting chart for the pattern 211F-24 Foire Sweater Dress. After casting on for the Back, 83 sts and knitting 4 rows of Twisted k1p1 ribbing I am stuck. Can you please help me to decipher this chart? I would appreciate your help to explain this chart immensely. How can you work first sl st of the rnd worked twice when there is a marker between the sl st and a stitch right after the marker? Am I reading the instruction correctly? Could you please explain this instruction? Thank you so much! Hi Tracy – It sounds like that stitch is worked twice (first it is slipped and at the end of the round it is knit). Which makes sense if you are moving the marker. Hi Roberta – No stitch just means you can skip right over that box in the chart. Those boxes are usually just added to clarify the pattern. Hi, there.. I am a beginner and I wanted to knit a colour work chart of My choice using only the purl stitch.. Is that possible..??? Please guide Me at the earliest.. I am making a baby dress. There is a 7 stitch repeat over 15 rows. For every third row there is a slip 2 as if for knit, k1, peso. This decreases the 7 stitch patter by 2 stitches, yet the next row shows all 7 stitches. I’m totally lost! Hi Susan – Are there perhaps yarn overs or some other increase that compensates for the decrease? Thanks for this tutorial. I’m new to chart reading and I’m confused about SSK and K2tog. The symbol occupies one square (representing one stitch), but obviously both of these require two stitches. So, for example, in the chart above under “What are the heavy lines?”, there is an 8-stitch repeat, but one is a SSK and one is a K2tog, so it seems to me that you would need 10 stitches to complete the row. What am I missing? Hi there, I am working on a dress which has some lace pattern inserted. I have a chart but unfortunately I have some geometrical shapes that are blank (and I also know for certain they do not represent k1 as I have the classical symbol of an empty box for that). How should I interpret the empty parts of the pattern? Hi Oana – I’m sorry, I really couldn’t say, perhaps contact the designer? I am knitting a sweater from Better Homes and Gardens found on Ravelry called Knitted Guernsey Pullover and Cap (http://www.bhg.com/crafts/knitting/kidswear/knitted-guernsey-pullover-and-cap/) with an 8-stitch repeating section in the chart. This is my confusion: I have a total of 83 stitches on my needle (as instructed by the pattern). It says to work the 8 stitch repeat 10 times (80 stitches), which should leave me with 3 stitches; however the chart shows 4 stitches on the right before the repeat and 3 stitches on the left of the repeat. That equals 87 stitches. Where are the extra 4 stitches coming from. There are also red and green lines on the pattern w/o any explanation what these lines mean? Can you help clarify? I included the link to the pattern so you could see the chart b/c I’m sure what I’m asking is confusing. I have a question about reading knit charts for hats. I understand how the yarn overs and knit togethers and all that work, however, once I start shaping the top, the chart just shows the band at the bottom, that I’ve already know and triangles on top, towards the crown of the head. Does this mean that I should decrease stitches or cast off to form those triangles? Hi Claire – it is a bit tricky without pictures, but a pattern should include either decrease instructions that are separate from the chart, or the chart should include symbols that show the decreases. Is it possible that the lace chart is decreasing in the triangles in a non-obvious way? Are there more decreases (k2tog, ssk etc) than increases (yo’s)? I have the same question! My hat pattern just shows decreasing 2 stitches a row, but has no symbols. Is their a universal decrease that does this? Nope, but the decreases may be written in the pattern? alexaludeman So even if pattern started off not joined and with a RS and WS, when it switches to being joined and knitted in the round, you only read from right side of chart even for formerly WS rows. I would assume so, that’s generally how charts work (that’s how I would do it). If you are still unsure you may want to contact the designer. The info should be in the chart notes. Hi Natalie – you got it! When knitting in the round charts are always read from right to left. Any suggestions for a good tutorial on knitting mittens using a chart. I have come to the thumb and am a bit confused on the directions. I am working on a knitting project that has 4 charts. I have had no difficulties until I got to chart 3. It has a lace repeat section; no problem there; BUT then there is one vertical row with a red box with a note, “expanding stocking stitch section”. There is no further instructions regarding this expanding stitch section anywhere in the pattern. What is this??? Thank you, in advance, for your assistance. Hi Toni – sorry, I have no idea, there should be information on that in the pattern or the chart notes. Maybe try contacting the designer? When reading a colour chart for top down sweater, do we start knitting the colour pattern from top of the chart or the bottom? Hi – good question, not usually, it should say in the chart notes where to start etc. Usually designers have their charts ‘upside down’ so they are still read the way your knitting works. I am new to charts in knitting but I am trying to knit a lace shawl from a chart. I think I understand the logic behind the chart. The frustrating thing is that I don’t know how to determine the number of stitches to cast on to begin with. Do I just cast on the number of stitches on row 1 of the 1st chart? How do I begin? Help!!! Hi Philona – you probably need more than just a chart (unless you are up for a little design work), is there no pattern to go along? With cast on numbers and instructions? I am working on a Capelet pattern and the chart shows 2 blanks at the beginning of a row. Do I slip those 2 sts. To right needle and begin pattern row on 3rd stitch? Hi Judith – it sounds like those are maybe non-stitches? You would just skip over them and go to the first instruction, no need to move any stitches around. I am working a lace chart that has blank boxes in the chart. The knits are indicated with a line. If I count all the boxes in the chart row that have a symbol in them, it equals 33, which is the number of stitches on my needled. So does that mean the blank boxes are “skipped” and I just move to the next symbol to work on the next stitch on my needle? Also, following that logic, I got close to the end of my row where it indicated I would have 7 more knit stitches to do, but I only had two more stitches on my needle. I’m guessing it has something to do with the symbol that is keyed to “sl1, k2tog, psso”. So I slipped the next stitch on the left needle to the right, then knit the next two left needle stitches together, then slipped the 2nd stitch on the right needle over the first stitch on the right needle. Hi Nancy – I would assume they are ‘no stitch’ boxes but it is hard to tell without seeing the actual pattern. You are working the sk2psso stitch correctly. Is there a key for the chart? Perhaps the designer could offer more of an insight? I think I figured it out… I wasn’t doing the yo right. Your clue of treating each square with a symbol on the chart as an “action” vs. A “stitch” made me realize I was doing a yo then a knit for each yo symbol. That Used up extra stitches causing me to run out at the end of the row. Hi. This is very helpful. My question concerns the needle requirement. I have a lace pattern for a shawl (supposed to be moderately easy but I’m not finding it that!) with multiple charts but always with differences between right-side rows and wrong-side rows. Yet the pattern calls for a round needle. I don’t understand why. Wouldn’t straight needles make more sense since one is turning at the end of every row? I see no place in the pattern where the rows are joined. Thanks much!! Hi Janet – you could probably use a straight needle but I too would recommend using a circular, even though you are not working in the round. The reason is that shawls tend to get to a large number of stitches and a circular needle will hold all of those stitches with no trouble. The other reason is that when working back and forth on straights with a lot of stitches it can sometimes cause your tension to change near the ends of the rows. The needle gets a little heavier, changing the tension on the stitches. A circular needle holds the stitches between the needles, evening out the distribution. The chart shown for a stitch/pattern called Triangle rib on the Freeknittingpatterns.com does not show even rows/ws rows and there is no instructions for ws rows in the key except for this: “l – knitwise in odd rows, purlwise in even rows; – = purlwise in odd rows, knitwise in even rows. How do I knit the even rows? Purl only or knit only or as a reversed “copy” of the previous row? It’s very confusing when the key doesn’t give clear instructions for ws rows. Please help. Tx. Hi Desre – I’m sorry, I have no idea. It should indicate how to work the WS rows in the pattern…. -left-handed knitters are following charts from left-to-right, bottom-to-top (starting at the left down corner of the chart). I’m not sure what you mean by left handed knitters? Knitting is a 2 handed thing…..
Well, I meant if you are a left-handed person (you write using left hand) and knitting in opposite direction to right-handed person (I know that even left-handed person can knit the same way as the right-handed person, but that’s not what I’ve learnt). I have my piece on the needle in right hand, while knitting with my needle in left hand. Hi Zuzana – It depends if you are working any of the stitches backwards (eg, your purls are knits and your knits are purls) and if you are working in the round. Because left handed and right handed knitters usually knit the same way (sometimes varying the way they hold the yarn, things like that) knitting patterns and charts are always (as far as I know) written for the one way (knitting moving from right to left). I’m not sure what advice to give without knowing EXACTLY how you are knitting. No. The charts are followed as the instructions above indicate. There’s no such thing as right or left-handed chart following. Knitting is a 2 handed fiber art. Unlike crochet, which uses only one hand to manipulate one live stitch; knitting used the right and left hand to manipulate a multitude of live stitches. In fact, the only “right” or “left” handed distinction is exclusively pertaining to how you feed your yarn. Every knit pattern is followed the exact same way by a righty or a lefty. However, a left handed person may prefer continental knitting and a right handed person may prefer throwing. That is not a hard and fast rule, it’s just an option. Stitches to be knit are on the left needle and stitches that have already been knit are on the right. I’m not sure how you can believe there is any different rules for a right v. left handed knitter. Yes there are different rules to follow if you knit left handed. I am left handed. I make my stitches using the needle in my left hand, the working yarn is held in my right hand. I read a chart from left to right. Directional decreases are made the opposite way that a right handed would make the. 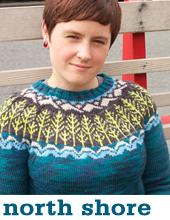 Zuzana – Ravelry has several groups for lefties that can answer your lefty questions. When knitting from a chart and following a pattern that has for example 58 stitches and in the chart only 28 of these stitches are needed to form the motive, what do i do with the remaining 30 stitches. So confused. Please assist me. Hi Debbie – I’m sorry, I’m not much help without actually seeing the pattern. The extra 30 stitches could be edge stitches? Usually the repeat will be indicated in some way (in a TCK pattern it will have thick black lines around it), otherwise I recommend either a swatch, or taking graph paper and graphing out the pattern, with any repeats, to start to see where they are. I am struggling with Ann Budd & Anne Hanson’s Top-Down India Print Henley. I have worked through many issues before even getting going, and, from the conversations on Ravelry, expect many more. However, I can’t find an answer to this seemingly simple qn about the “bracket” indicated on the Eyelet Lace chart. This is just the third row of the neck after CO, knit and purl rows and I am stuck. What does it mean to “work Row 1 of Left front eyelet lace chart over 2 sts indicated by BRACKET for your size.” The bracket shows YO and K for the size I am doing (30″) and 2K for the next size up (36″). That means my neck stitches will double in size while the next size up retains its number of stitches. That makes no sense. Hi Teresa – if the next size up is yo, k2 then it will be increasing as well, just not at the same rate. Have you tried contacting the designer? They are usually quite helpful and know their patterns inside and out. Thank God I found this blog. I am currently following a pattern that has two charts. It states to start with chart 1 then follow same row on chart two, starting on the right side. On the next row do I start from the left side of the chart on both charts? I have thus pulled this portion out a few times as it does not look right, though I am not sure how it is supposed to look. Help?? I a left handed; I knit with my left hand, taking stitches off my right needle to my left needle. Can I just follow the chart as written? Nope, you would have to reverse it. When I teach left handers to knit I usually have them knit the same way, just holding the yarn in their left hand (knitting is a 2 handed process, like playing the piano), that way patterns and charts etc. still work the same. I am knitting a blanket in intarsia with a college logo. The chart I have is numbered from the top down and left to right rather than starting at the bottom right. Does it matter where I start for a blanket? Should I still start at the bottom right knitting right to left and purling left to right on the even rows? Hmm, without looking at the pattern I’m not 100% sure. Usually you would want to start at the bottom right and go right to left. You may want to contact the designer? Hello! I’m knitting a hat, but I don’t really understand how decreases work in charts. Could you please help? I’ve left the link in my username to the hat I’m making. Thanks so much! I have done some chart reading, but recently I’ve come across something I’ve never seen before. I’m knitting a circular shawl that has several charts. One chart has a check mark roughly in the middle. The check mark isn’t anywhere in the symbol list, and none of the other charts have it. The pattern notes say nothing about it. It’s also weird because that part of the chart has repeat lines, so even if it was marking the center (for reasons I don’t know) it wouldn’t really be the center because it’s repeated. I’m really confused about this one. Please help! Hi- I am knitted a 29 row pattern from chart on dpn in the round. It says to repeat chart 6 times. Do I start back at row 1 ? Hi Sheila – yep, unless otherwise specified you would start back at row 1. There is most likely a pattern repeat that will be worked more times on subsequent repeats of the chart. I am working on the glass utterly hat by Kate gagnon Osborn in the book Weekend Hats. The chart has dark gray square (not to be confused with the light gray “no stitch” square. ) and I can’touch find a reference for it in the legend or in the book. Can you tell me what this means? My pattern asks that I knit 1 below. Does that mean that I also knit the purl stitches that appear 1 row below? Or do I purl the purl stitches? If a chart of 20 stitches asks that I purl 2 stitches together, twice, on the return row (row 2), do I have 18 stitches and adjust the chart accordingly? Hi Velma – if there are no increases to compensate then your chart should be decreasing. Hi Ellen – I think something must be wrong if the stitch count doesn’t work. It should go evenly (i think, not having the pattern in front of me). I might check for errata? I am a very new newbie to reading chart. I thank you for your tutorial here on charts . My question is on the pattern I am working it is in both written and chart and on the chart I’ve come to ‘Work even in pattern as established until piece measures 18 in . The chart shows rows 1-18 and I am currently on chart row 2 and now must work even ? does that mean work the chart up to row 18 and if it doesn’t measure the 18 inches by then do I go back down to row 3 and work my way up the chart until the piece measures it’s 18 inches ? Hi Rosie – your pattern should have instructions on the issue. The chart may have a row repeat to work from (eg. work rows 3-18 to form pattern), and you would continue working the chart as set. I am looking for some help with a fair isle chart. This chart identifies different starting points depending on the size you’re knitting. The repeat is over 16 stitches. I am having difficulty understanding how to complete the repeat with a different starting point. Any help/guidance would be appreciated. Hi – you will usually have a particular starting point, and the repeat should occur after that. You will have some stitches outside the repeat, then work the entire repeat, then work the end stitches outside of the repeat. Does that help? By the time you have worked out what kind of chart it is, gone on Ravelry to ask why it makes no sense, tried to fathom out all the missing bits and why they are missing and wondered why some knitters are so phobic about using words, you could have finished the thing. For instance my very simple chart includes wrong rows but some don’t (but hey some do). Then it is meant to be a circular chart but the wrong side rows are showing as flat. But I know what they mean don’t I? Or perhaps not. Charts are hideous things requiring a whole lot of time spent writing them out first. When I have paid for a pattern that says it includes written instructions (when they mean a couple of words which obviously pained them to use as they are so sparingly used) but does not include any full instructions for the item to be knitted but rather a horrible chart, it is misleading and very very annoying. Yes, some of us REALLY do hate charts, and yes we can do them if we really really really try (but why should we, when we hate them so, we like to enjoy our knitting) and if we are prepared to spend hours on them (I’m not). No we don’t find it fun, we don’t want to be challenged we just want to knit the think we want to knit. Just like lovers of charts frequently hate words which need to be prised from them and is the reason why patterns are difficult. Patterns are not difficult, the lack of skill in sharing the information on what to do is responsible. Difference is, chart lovers need to make no excuses for their preferences. Yet we are treated as simpletons by others who are convinced that charts are so easy (despite the fact that we don’t all share the opinion) when we share ours and are frequently ridiculed, derided and made fun of on places like ravelry. And then every chart is different!!!! With its own rules that we are left clueless about, and then we have to go off into internet land to try and find out the meaning of stuff which is frequently left unresolved because no one knows! But it’s easy because it’s a communal language!!!! Amen to that! I am trying to figure out a chart from a Rowan pattern and am mystified by the lack of information and totally confused by the apparent plethora of definitions for the same symbols. Would it be totally unreasonable to have an international commonality of symbols (such as those used in automobile manuals)? Yikes! Can’t get this pattern to work no matter what – I’ve tried about 25 times so far and only found this blog because I’m searching for some answers. I am starting a chart with a design across 16 stitches. The very first stitch says it is blank, no stitch and the next two stitches are knit. What do I do with the first stitch, slip it or is the first stitch actually the knit stitch? Thank you! Hi Melonie – no stitch means just that, it’s not a charted stitch, just a blank box, usually inserted for clarity. You will be knitting the first 2 sts. This is an awesome resource and I hope you never delete this page! Finally! What a helpful site. Thank you so much. Your instructions clarified issues I’ve been dealing with. but no instructions are given for the even (wrong side) rows. The pattern does not seem to me that all wrong side rows are purled. Most of the patterns on this website (freeknitstitches.com) seem to omit the even rows, but I can find no instructions on the site about what they intend them to be. Figured it out – it’s slip-stitch or mosaic knitting where the even rows are identical to the odd rows, just knit from the left. (All worked stitches are worked, all slipped stitches are slipped again). I’m knitting a vest pattern with a right side cable chart and a left side cable chart, pattern is by Bristol Ivy, and the name is Delius. I’m shaping the armholes working on the front of the vest back and forth. Great that the charts show working in rounds as well as working flat. I’m now on the wrong side and don’t know if that would be the left or right cable chart. I worked the right side starting with the Right cable chart. Would “Slip as if to knit” be shown on a chart? And if so, how would it look? I’m knitting a patterned cardigan “shrug” with a japanese pattern. I’ve read various “how to read Japanese knitting charts” but I still cannot tell if my pattern’s “pattern stitch” chart is showing ALL rows or just RS rows. How do I know for sure? The rounds may be numbered or it may be in the chart notes…. I have a question. I have this horse hat knitting pattern. On the chart it shows the knitting square as being half it size (width) and the x represents the cc, but is placed on the right side of the skinny box. Help??!!? Hi Dawn – I can’t really help without seeing the pattern. I don’t know what the skinny box is etc. Is there a key to the chart? Maybe try contacting the designer? The pattern repeat for row 1 says [ssk, k1, yo, k1, yo, k2tog, k1], but isn’t that only 7 stitches? It seems to me that there’s a k1 missing before the k2tog. Or does the k2tog symbol mean it applies to the empty square on the chart as well? You are correct Kathy, there should be another k1. Thanks! We will get that all fixed up. I was confused about this as well. It looks like the pattern hasn’t been corrected yet. Thanks for the great tutorial! I have a pattern that has a chart and the instructions says to do 5 repeats of the chart. Does that mean I do the chart 5 times or 6 (the first one and then 5 repeats) . I’m not sure, is it a Tin Can Knits pattern? If so, let me know which one and I’ll investigate further. Every designer uses different pattern writing language / style and conventions, so it depends. I’d guess it’s a total of 5 repeats, if that’s what it says, but if it’s described the first repeat, THEN says ‘repeat the chart 5 times’, it’s more ambiguous. Go with your gut and if it makes the mittens / hat / sweater long enough, then you’re golden. When it says maker on the chart. Does that mean I place the marker and knit the stitch or the square is just place the marker and do what it says for the next stitch it shows for the next stitch???? Every designer’s pattern writing and charting conventions are different, so I can’t say for sure. Have you checked the chart key and any chart notes or notes in the written pattern about this? Hi, hope you can help me out, trying to knit the Top Down Raglan Summer Lace Cardigan & am having a dickens of a time trying to figure it out. It has a written pattern up to the 8th row but from 9 on is a chart which makes no sense to me. It does show the repetitive pattern of lace which I can see but that’s about it. The chart starts at the raglan stitch & goes from there, I have written out what it shows for 1st row and it doesn’t show the 2nd or 3rd raglan stitches like the written pattern does. I have gone on you tube & looked at how to read charts but to no avail. Even trying to write out the pattern it doesn’t tell me where the front, raglan, sleeve, raglan, back, raglan, sleeve, raglan, front breaks are. Also there is knitting, yo, ssk’s, k2tog’s before the 1st & after the last raglan stitches (which is the front). I have knit numerous Leisure Arts raglans and never had any problems. I have also knitted a lace scarf, so I have some experience. Thanks for listening. Hi Sue – it is hard for me to say what is going wrong without looking at the pattern (the Top Down Raglan Summer Lace Cardigan isn’t one of ours), have you tried contacting the designer? HI, I have a chart where the bottom row is labeled number 1 on the left rather than the right. Does that mean the first row is the wrong side and I read it left to right? Rather than reading the first row right to left? Thank you very much for your help. I would say probably, that is what it would usually indicate. It should be in the chart notes where to start too! I am working on red hearts Butterfly Cable Blanket LW3884 and cannot figure how to go about inserting the Leaf chart into the Leaves and Berries chart. Hi Carol – I’m not familiar with that pattern, but my suggestions would be to ask at your local yarn shop, and if they can’t help, then contact the pattern designer directly with your question. The shaded grey stitches have likely been used in the chart to compensate for changing stitch counts in the pattern from round to round. So it’s not that you skip stitches, it’s simply that you’ll skip over that square in the chart, and go on to the instruction shown on the next square, and use that instruction to work the next stitch that you have on your needles. Hope this helps! This tutorial is heaven sent! Thank you so much! I’ve only read lace charts that had RS rows and just started one which had both RS and WS rows on the chart Now know that I should’ve been reading the WS row from left to right. Have had to frog my work twice halfway through. Hopefully it’ll turn out right this time. So I just started the Prairie Fire pullover and I have gotten to the lace chart. I can follow charts fairly well, but I am a little confused with this piece of the pattern. I am on round 3 of the lace chart and the pattern says to “knit to the chart and knit next chart round”. My confusion comes from not seeing how many knit stitches there are before I begin the lace chart. For round 3, there are two increase sts at either end of the front section, so would I still be knitting 20 sts before I get the lace chart? Am I supposed to include the increases in the stitch count? I hope I explained my confusion in a way that makes sense. Any help would be super appreciated! :) thank you so so much! Hi Abby – the chart is increasing while the stockinette around it is decreasing. So for the next round you are knitting to 1 stitch before the k2tog of the last charted round (or 2 stitches before that if you are working round 19). You could place a marker around the chart, but you would constantly be moving it to account for the increases. HI, I’m trying to knit snowflake and am doing lace knitting for the first time. I’m very sure I’ve got my markers in the right place and i am reading right to left but somehow the number of stitches doesn’t seem to match up. For example for chart A i have 5 stitches until the centreline stitch and i have to k1, yo,[ k1, k2tog, yo,] k1 which by my calculation will use 7 stitches. What am i doing wrong? I’m really confused. Hi Claire – I think it’s just your calculations that are off. You don’t need a stitch to make a YO so you don’t need to count those. You have k1 (1 st), yo (no stitches used), k1 (1 st), k2tog (2 sts), yo (no sts used), k1 (1 st) for a total of 5 sts. Hi, i brought a pattern from iceland back home, in the chart i see a cross line over 2, 3 or 5 stitches ending in a vertical line. Does this mean that i have to knit together 2, e or even 5 stitches? Hi Wilhelmien – every knitting chart is different, so I can’t say for certain what the symbol you are referring to means. You may be right! Is there a key which explains the different chart symbols? So just as you did the first time you worked chart B rows 1-24, you’ll keep the centreline in place. So in Row 1, you’ll work the FIRST A as k1, then the rest as ssk, and the LAST B as k1, with the rest as k2tog. You’ll do this for each section, before and after the centreline stitch (because they’re the same… they create 2 identical triangles of lace). Hi! First time stranded knitter and I think I’ve bitten off more than I can chew!!! the pattern has 16 stitches including what they call the “centre stitch”. I needed to cast on 31 stiches. I presume I repeat the pattern once – but what do I do with the “centre stitch”? ps its knitted flat. So I’m also unsure about what I do with the centre stitch when I haveG to turn around and work purl??? Hi Jacqui – I’m not sure how to help, because I don’t know what pattern you’re working from? I’m assuming it’s not a Tin Can Knits pattern, as the instructions don’t sound familiar. Perhaps you should contact the designer directly with your query. Hi Pat – it depends on how big you want your dishcloth and which yarn you are using. If you want an 8″ dishcloth and you are using worsted weight yarn you will need about 36 sts. You have 19 sts in the letters of your name, you will need a few sts in between, say 3 giving you 25 total charted sts. You will want a border of 5 or 6 sts on the edge so you will cast on 35 or 37 sts. I have a knitting diagram that has yo and knit 2tog symbol in the same block. Row before has 16 stitches. Next one if count this one block has 17 stitches. What do I do? I’m not sure, is there a key for the pattern? There should be chart notes that explain such a symbol! I am working on a lace shawl using a chart. The blue repeat section has me stumped. As I worked through the repeat section once, and then a few rows later, twice etc…. I found that I didn’t have enough stitches to complete the entire repeat section and then full execute the edge section as well. Is there an unwritten rule about this somewhere? Or have I messed up somewhere along the way? Once I get through the repeat, and I have the final edge stitches left, do I stop the repeat and move forward to the edge stitches? Or once I repeat this section, I should always have just the right amount of stitches to repeat it fully while also finishing the edge? **SOB** that’s what I was afraid of. I guess I’ll pull out my work down till I hit where I started this repeat section. I think I had it perfect up till that point. I have been knitting for well over 60 years and have never understood lace charts although l can follow written instructions and colour charts. In fact we made our own colour charts to knit a pattern on the back of mittens at primary school, boys included and then knitted them. I knitted a lace pattern hot water bottle as well before l left but from written instructions. Got into awful trouble for reading at the same time and making a mistake. We got thumped if we made knitting mistakes. Thank you for making it so clear. Am knitting first lace, a sweater, and it is in the round. Starts row one of chart with three sts then the repeat begins. Of course, there are increases, so now there are 11 sts outside the rpt. After 14 rows I have to repeat row one, etc. The sts are K K YO. So 2 sts into 11, I have one left over before the repeat. Should it divide evenly, or ? Hi Laura – I’m afraid I’m not much help without knowing the pattern. Do you mean there are 2 knit sts and a yarn over within the repeat? That doesn’t sound right because your repeat would create a lot of increases. I’m knitting a lace pattern for the first time. I have six edge stitches then a ten stitch repeat pattern. I don’t understand how to keep the ten stitch pattern correct when I need twelve stitches to complete all the increases and decreases. Am I missing something here?. Hi Debbie -maybe, it’s hard to say without looking at the pattern. Is it possibly that the number of sts changes? It’s also important to remember that decreases take 2 or more sts to work, but only appear as 1 symbol, and yarn overs take no sts to make but also appear as 1 symbol. Perhaps the pattern uses different symbols than us? I have a really stupid question… Is the first row of my chart the cast on row and how do I know if the next row is a knot or a purl row? Thanks so much for the fantastic tutorial. Hi! I am a beginner knitter and hope you can help me… My pattern (from Classic Elite) calls for purl on right side and knit on wrong side then continue knitting in a repetitive pattern. How do I purl on right side and knit on wrong side? ﻿(I though we were always knitting on right side and purling on wrong side…) Thank you for your advice! You can knit or purl on any side, I suspect the pattern has the purl side ‘showing’ or as the right side? Hi working on a lave pattern shawl and I am confused because my markers do not seem to stay in place. So I am confused as how to proceed. Can your markers move and the knitting be correct? You may want to double check that if you have Yarn Overs right before or after the marker that they are staying where they should, that you aren’t moving the markers by misplacing the Yarn Overs. I am working a cable pattern that starts row 1 ws on left side of chart. should the chart be read with odd rows left to right and even rows right to left? HI Lynn – I’m not sure, since I don’t have your pattern and chart in front of me. Have you read the chart notes or instructions? I would guess that row 1, WS should be read from left to right, and then the following row (row 2, RS), would be read from right to left. But every designer choses their own chart ‘conventions’, so there’s no way for me to know 100% how your specific chart is meant to be read without seeing it. I am working on a sweater where the back is three panels and has three different charts. One chart for the left, one for the center, one for the right of the back. I’m assuming that when I turn the work to work the wrong side rows that I also change the charts order. So for the wrong side I would use the left chart first, then center, then right. Is this correct? I’m about six rows up and wanted to make sure I’m doing this correctly. I am reading from left to right on each chart on the wrong side row. Thank you! Yep, on the RS you would work right side chart, then the middle chart, then the left chart. On the back you would work left, center, right. For some reason I am able to knit from charts, but each time a new chart pops into my knitting I need a refresher course on HOW to actually use them. Your tutorial is amazing. Thank you for this incredibly useful post! If working a colour chart for fairisle do you just look at the chart and then write it out so it is easy to follow? I wouldn’t ‘write it out’ – I would simply knit following the chart. That way you can refer to how the chart looks, and see if your knitting is matching. You work two yarn-overs in a row by simply wrapping the yarn TWICE around the needle, rather than just once as you would for a regular yarn-over. On the return row you would work into this double wrap twice (typically… unless pattern states otherwise), purling the first yo, then knitting the second yo. Hope this helps! This is a very useful, straightforward tutorial! Here’s a question I’m not certain about. And for any sort of directional stitch, should I likewise attempt to do the opposite? I.e. ssk to k2tog, m1R to m1L, and vice versa? Thanks. I’m not 100% sure. When I teach knitting, I teach everyone the same, because knitting is 2 handed, like playing the piano. Sometimes lefties throw with their left like I do (I’m right handed but do some things with my left). So I suppose my question is how you do it backwards. Is the right side still facing you? Yes, the right side is facing me while I work, I just knit from left to right rather than right to left. I guess that would be called mirroring? I get the feeling that I would switch some directional stitches as I have encountered that issue before, especially with the M1’s. Have begun Antler Hat pattern. Knitting size L. After doing “set up” round is where I’m confused. I want to follow written directions for cable. Need some help please understanding what to do next. Thanks. For the Antler Hat you are working a number of purl sts (either 3 or 5 depending on your size) between the cables. So you will purl in the purl section and work row 1 of the chart or written directions in the cable section. This was so helpful! Thank-you so much!!! I used google and it actually came up. So now I know what ‘NO STITCH’ means. Thank you. Can someone tell me what it means when I chart has 2 squares in a row and the key says “no stitch”? I’m not clear when I read this in a pattern chart for knit in the round a cowl : Begin chart 1 and repeat the pattern 16 times and then knit chart 1, rows 1-6 3 times. I casted on 60 stitches and the chart has 6 rows. I would like to know how many times do I have to repeat the chart.Thanks. Hi Alexia – I’m not really sure without reading the pattern. Possibly there are 6 charted rows but a ‘relief row’ (like a knit round) in between? What are the chart rows numbered? I have the chart and am unsure how to actually DO it, do I cast on ALL the stitches ((60)) and continue with that? Or do it separately and stitch all together? Or knit it in the round? I know the big red line on it is where you do the thumb. But other then that, I’m not sure how to do this. I’m going to start it working the entire thing in the flat, putting the ‘thumb’ stitches in a bit of spare yarn and then taking it up once done. Its just a bit confusing as there is nothing BUT the chart and red lines that’s it. Are there chart instructions? I would hazard a guess that they are knit in the round. Usually patterns come with both written instructions on how to work the mitten, how to insert the chart, etc. So when working a pattern in the round you remain on the right side of the work, so you would consistently read the chart from right to left? Thank you so much for this lovely tutorial! Your careful descriptions and illustrations gave me my “Aha!” moment. As I can’t afford “real” classes, I greatly appreciate the time you took to write this. I have a chart for a shawl called Tipperary. The first line of the chart is numbered 1 on the left, line 2 on the right. Do I knit left to right on line 1 and right to left on line 2? Thank you for your help. I’m sorry, I don’t really know, usually charts are right to left on the RS and left to right on the WS. Is the side of the work specified or are there any chart notes? You may want to contact the designer for more details. Also I am knitting in the round trying to follow the graph. In knitting a sleeve for a gansey sweater, in following the chart, pattern says right-left-right. Does this mean not reversing the graph? Sorry, I’m not much help without actually seeing the pattern, is it knit back and forth or in the round? Does this mean you knit the first 4 rows? Good question, just skip them. They are usually put in to help show the pattern, but you can just ignore them. Your site has most complete lesson on charts. Was so glad to find it. This is one chart that becomes lop-sided when I follow it. I have found others. Is there a technic that I do not know. Designer says there are no errors and just follow chart. Have been asking on other sites and on some google says my acct. Has been deleted. That’s another can of worms not to be done today. Also are you meant to reverse the stitches on the WS? I’m confused! Yes! When you are knitting in the round, you will read all chart rounds from right to left (in the direction that you knit). Good luck! Wanted to say thank you for all that you do for others.